This courtroom drama takes its cases from real life. The stories and testimonies are sometimes presented as flashback. Famous Jury Trials lets the listener decide guilt or innocence. stand before the bar of justice..."
Famous Jury Trials aired on the Du Mont network from 1949-52. A dramatization of famous jury trials in history analogous to the radio series You are There. It featured flashbacks to incidents being described by the witness who was testifying and a reporter played by Roger DeKovem and DeWitt McBride. The result is series of thrilling true legal stories told in a gripping semi-fictional format. Maurice Franklin starred and the judge advising the jury to, "Be just and fear not." Some of the famous trials exhibited on this show include The State vs. Aaron Burr (as seen right) for the murder of James Hamilton; and many others. This series will interest legal and political history enthusiasts. For more courtroom drama, see also: You are the Jury, Order in the Court, A Life in Your Hands and Up for Parole. 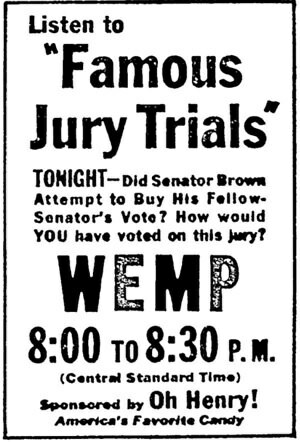 Be the first to comment on "Famous Jury Trials"